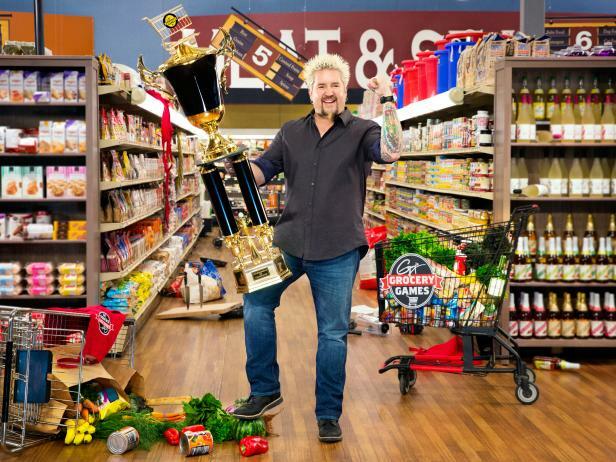 Host Guy Fieri is welcoming back past Triple G champions in Guy's Grocery Games Tournament of Champions, premiering Sunday, Nov. 29 at 8|7c. Sixteen of the most-unforgettable previous winners return to battle it out in the five-part series. They will face challenges that test their culinary prowess and innovation for a chance to earn a spot in the grand finale. The single winner will claim bragging rights as the ultimate Triple G champion, and he or she will get an extra run at the Shopping Spree for a chance to become the biggest prizewinner in the show's history. Things get dicey when four returning champions each make an innovative appetizer whose details are dictated by four tumbling dice. Then, each of the chefs must make an upscale lunch using Clearance Cart items that rate low on the gourmet scale. Finally, pigs fly when the two final chefs turn the ingredients for gingerbread cookies into a pork dinner. The winner earns an encore Shopping Spree and a spot in the tournament finale. Four returning champs are out to prove their first win was no fluke when they make their best breakfast featuring ingredients like frozen kale and kumquats from Guy's Grocery List. Next, the chefs are challenged to make a hearty sandwich and side, but they can shop from only the odd-numbered aisles. The finalists must shop for the Red Light Special for their decadent dinner even though they are told the store will be closing in a few minutes. The winner gets a repeat Shopping Spree and a spot in the finale. Four returning champs battle it out for more money and a spot in the Tournament of Champions finale. First, the chefs must use both their cooking and spelling skills to make an adventurous lunch using only ingredients that begin with "M." Next, the champions are challenged to each make their best dish fusing the flavors of Greece and China. Finally, the remaining two chefs will have to create a contemporary American dinner with coconut prepared two ways, using items from only three aisles. Four returning champs first must prove they are upper-crust by making pizza without using any traditional pizza ingredients. Next, the chefs must search the store for clues that lead to the mandatory ingredients in their best Asian dish. Then, each of the finalists must face the feared Food Wheel and make an extravagant dinner using a randomly selected protein and money amount. 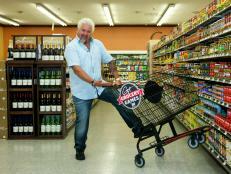 The winning chef will get to go on his or her second Shopping Spree and earn a shot at becoming the Grand Champion. It is the ultimate throwdown as the final four champs compete for the title of Grand Champion! First, these two-time winners discover the road to victory will not be easy when they are each forced to make a hearty lunch with a total of seven ingredients from only the canned or frozen sections. Then, they each must conquer the Fieri Food Pyramid and prepare their best breakfast using odd items you would never think of putting in a morning meal. The two remaining contenders bowl to determine which aisles they can shop from for their winner's dinner before they get caught off-guard by a Station Swap. Only one will become the biggest prizewinner in Guy's Grocery Games history! Fans can head to FoodNetwork.com/grocerygames to relive video and photo highlights from past battles, take the official Triple G quiz, collect shopping tips from the judges and much more. 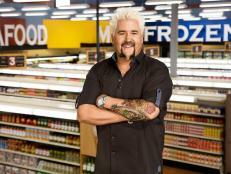 Join the conversation on Twitter using #GroceryGames.